Morandi is a sans serif typeface created by Jovica Veljovic and published by Monotype which is comes in 48 styles, 3 widths (Pro, Condensed, Extended) each with 8 weights (from Thin to Black) and italics and a wide range of OpenType Features. It is a versatile in a wide range of print & on-screen applications. 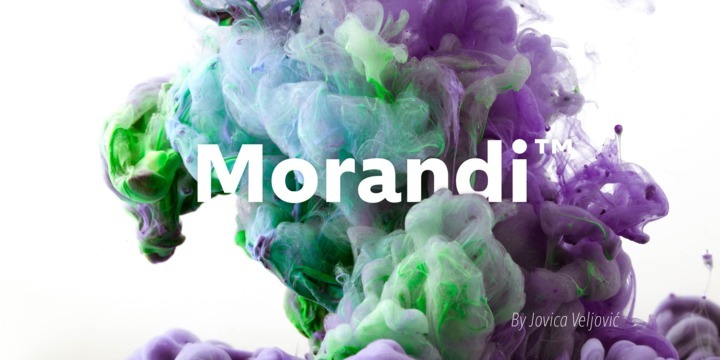 Morandi font cannot be missed! Styles: Pro, Condensed, Extended, Thin, UltraLight, Light, Regular, Medium, SemiBold, Bold, Black, Italics. Note: “Morandi” is a trademark of Monotype Imaging Inc. and may be registered in certain jurisdictions. Price: starting from $49 for one font to $299 for all 48 fonts. A font description published on Tuesday, May 29th, 2018 in Fonts, Jovica Veljovic, Monotype by Alexandra that has 1,939 views.